After suffering a decline when it broke below an uptrend line, this stock is trying to base. It is quite weak compared to many other stocks that have recovered but there are signs that it may want to go up. 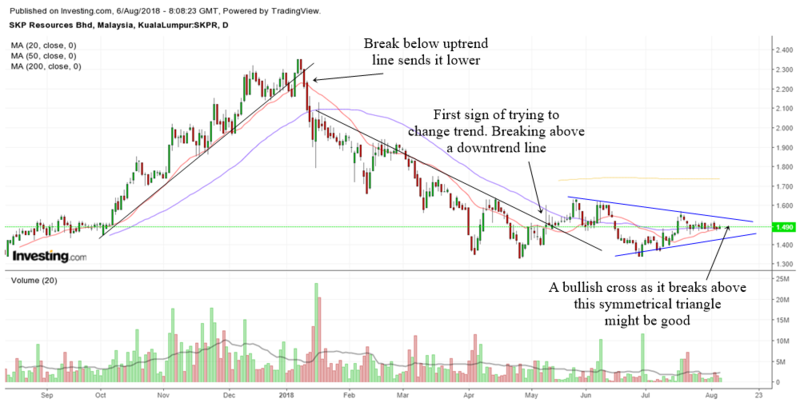 Looking at the daily chart, the stock has managed to break above a down trend line. That is usually one of the signs of trend change. Next, the stock may be trying to form a symmetrical triangle break out. We do not know which way it wants to break but a break above the symmetrical triangle may hint of higher prices. A bullish cross as it breaks above the symmetrical triangle will reinforce a bullish case in the stock. 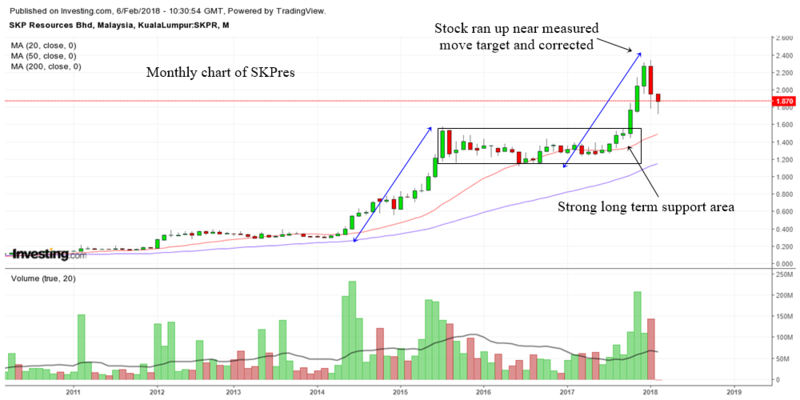 When we switch to the weekly chart of SKP, we can see why the stock is trying to base. 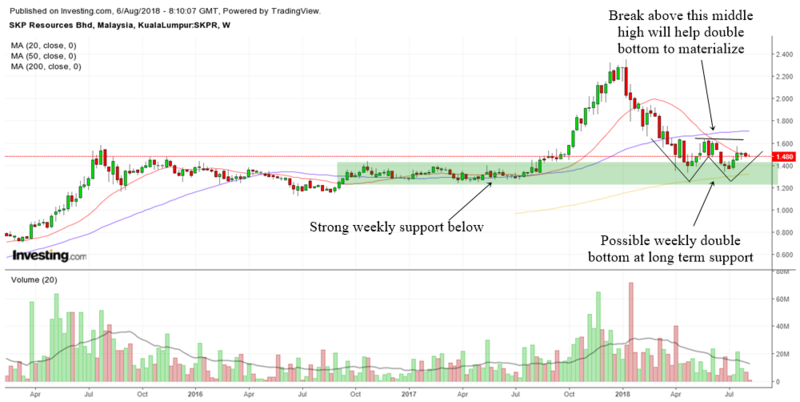 It has fallen to a very strong long term weekly support. This area of congestion will not be easy to break. Therefore, an investor should try and see if the stock is showing any signs of bottoming and starting a new uptrend. The stock may also be trying to form a weekly double bottom. The double bottom will materialize when it breaks above the highs of the middle. Despite being in a very strong long term uptrend, SKP Resources is currently having some short term weakness. When and at what price will this stock be a good buying opportunity? When a stock has long term strength, every short term weakness should be viewed as a potential buying opportunity. The reason is the stock may be a very good stock but the market environment is responsible for making the stock go down. It can get tricky to try to find the ideal place and situation to get on board. Which is why technicals will help you out a bit in trying to find the best price to buy this stock. We will look at the monthly chart of SKP Resources first to get the big picture for this stock. It always amazes me how a simple method such as the measured move can be used to set a realistic target for stocks. Even in the monthly chart, we can see how the measured move target can be used effectively. The measured move which I have drawn in blue color is where you take the height of the previous run up in the stock and project it from the base of the consolidation to get a realistic target. SKP Resources almost met the target and subsequently it corrected. The whole consolidation box that I have drawn is actually a long term support area for the stock. Usually its a good idea to buy the stock as it corrects to the area of a long term support. This is what we call "buying the dips intelligently". You have a reference point to look at right now. That will be the 1.50 area and if the stock drops to that area, it can be a buying opportunity for long term investors. The next chart I'm going to show you is the weekly chart of SKP Resources. The stock is still a bit far from the ideal support area of 1.50. 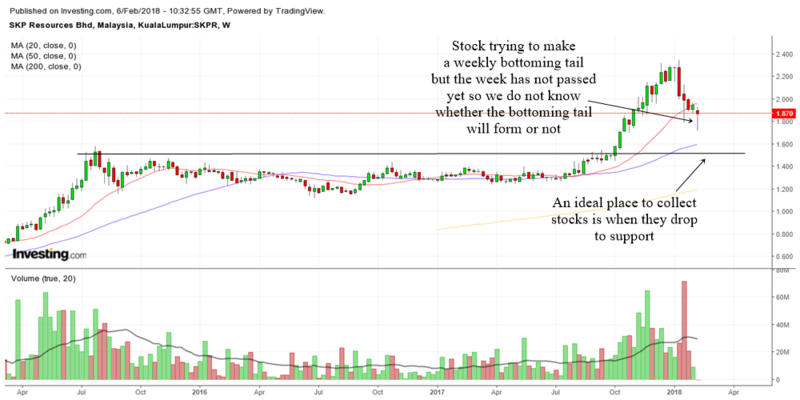 It is trying to make a bottoming tail in the weekly chart but since we are just in the 2nd trading day of the week, we do not know whether it will form a bottoming tail reversal pattern by the end of the week. Perhaps it would be a good idea to wait till next week to see if some bullish reversal candlestick patterns appears in the weekly chart. 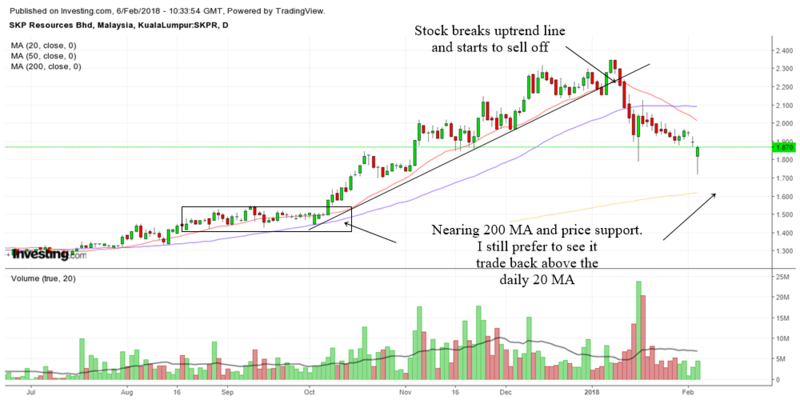 The chart above is the daily chart of SKP Resources. As with most stocks, this stock broke an uptrend line and proceeded to go lower. Breaking an important uptrend line usually signifies the beginning of a new downtrend. So far, I do not see an end to the downtrend yet. We do see a daily bottoming tail today but I still prefer the stock to fall to the 200 MA and price support. I also prefer to see the stock go back above the daily 20 MA. When it comes to bottom fishing, one should be really really cautious and slow to press the buy button. When you are bottom fishing you are really trying to catch the exact moment the stock changes trend.